Alkadyne HCR193B is a PE100 resin with high stress crack resistance (HSCR) and is a new class of PE100 material. HCR193B has many times greater stress crack resistance than standard PE100 resin. HCR193B enables you to work with your designer to achieve more efficient pipelines, longer lasting pipe networks or reduced installation costs. PE100 pipes are designed to convey water and gas under pressure over a long and trouble free service life. Harsh installation conditions particularly when using trenchless installation techniques and certain maintenance practices can cause stress concentration in the pipe wall, which can initiate a stress crack and lead to brittle failure. 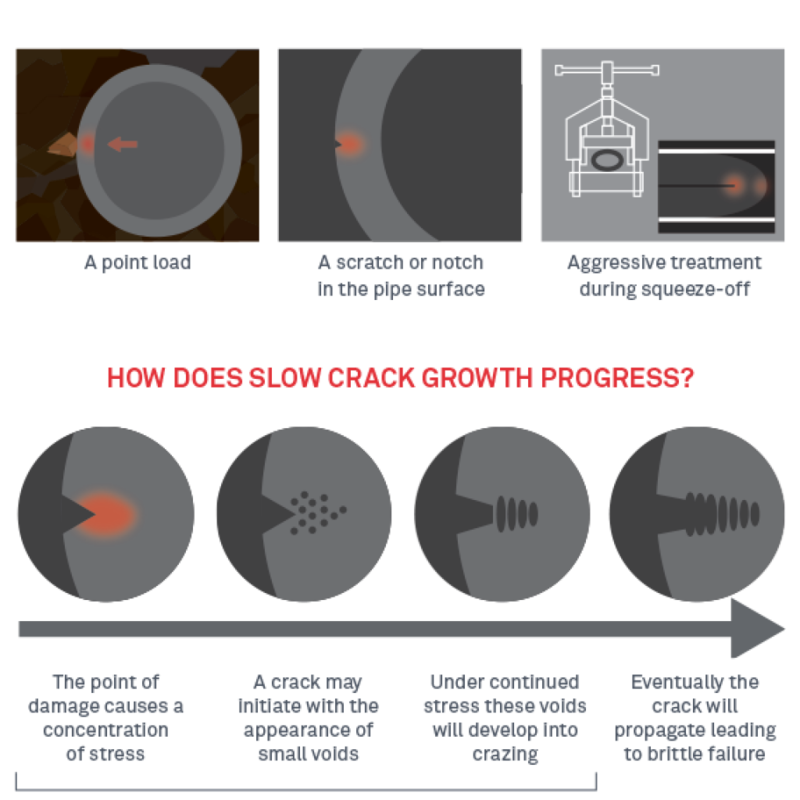 Specifying a high stress crack resistant (HSCR) grade of PE100 can reduce the risk of crack initiation. Alkadyne HCR193B is Australia’s first PE100 HSCR pipe resin made by Qenos with exceptional stress crack resistance. Comparative evaluation in the Notched Pipe Test (ISO 13479) has shown that HCR193B provides up to 10 times higher resistance against slow crack growth and pipes based on this resin are able to exceed minimum failure times even at notches deeper than the standard 20% of wall thickness. 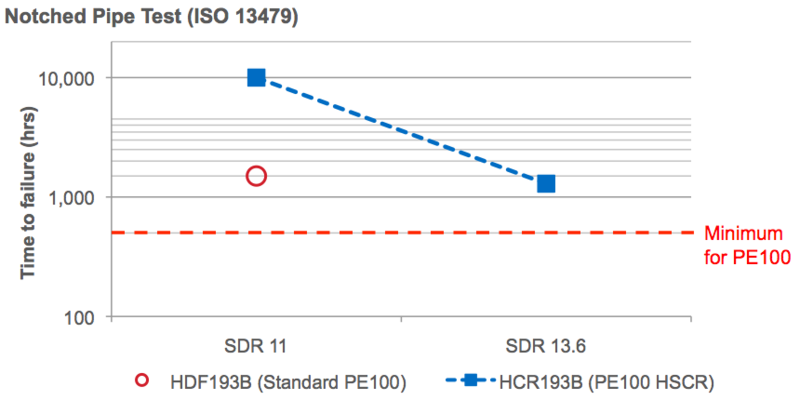 The exceptional resistance to slow crack growth of HCR193B can lead to increased pipe service life, lower maintenance costs and reduced replacement rates. 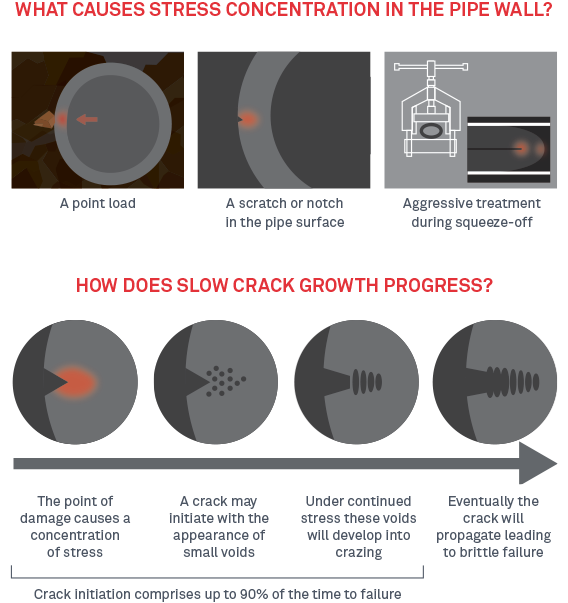 There is the potential for stress concentration to initiate slow crack growth wherever “squeeze-off” is used to manage pipeline flows for planned or emergency maintenance. HCR193B increases resistance to the initiation of slow crack growth wherever these stress concentrators are present. 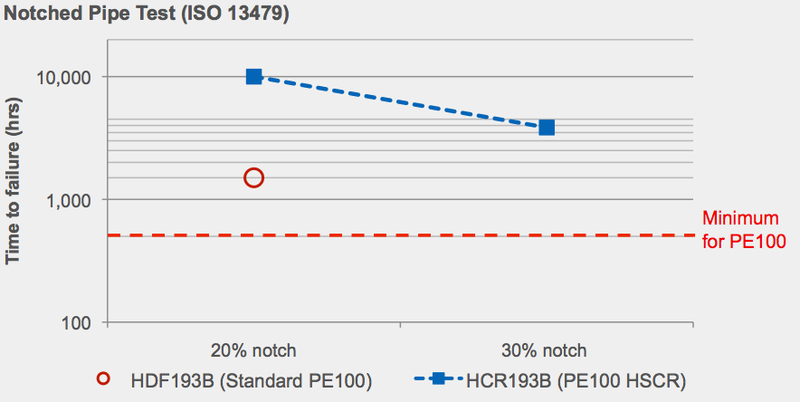 HCR193B has been proven to exceed minimum requirements for slow crack growth in the Notched Pipe Test (ISO 13479) even when pipe wall thickness is reduced by one SDR size. Pipeline designers can capitalise on the potential to downgauge pipe (reduce wall thickness) in trenchless installations by using appropriate use of design factors and “fit-for-purpose” design methodology. Qenos is able to support pipeline engineers with alternative tender submissions. Downgauging decreases costs while increasing efficiency. Reduced material usage lowers pipe costs and environmental footprint, while improved flow decreases pumping costs. 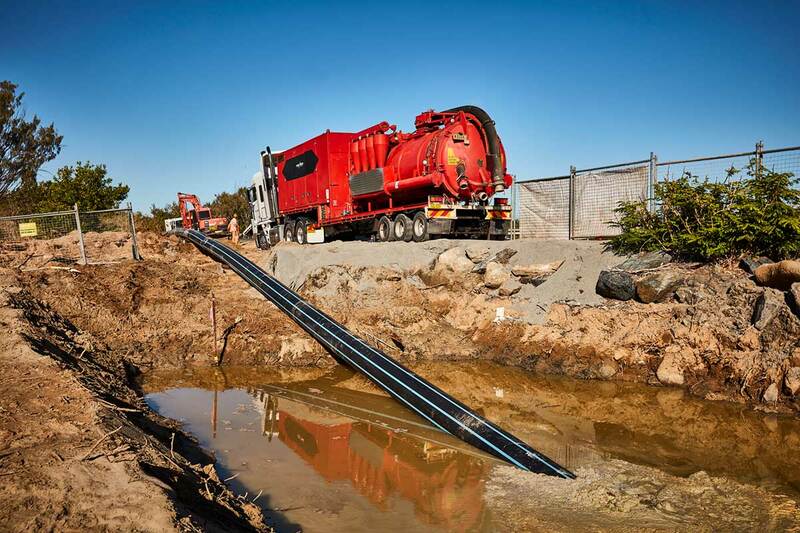 Watch how the first PE100 HSCR pipe installed in Australia by horizontal directional drilling enables a water main capacity increase to support future growth of the communities in the Livingstone Shire QLD. PE100 HSCR (or PE100-RC as it is known in some countries) has been widely used by utilities in Europe for many years due the increased use of trenchless installation methods. Despite this, there are currently no established national or international standards that define high stress crack resistant PE100 materials. The Plastics Industry Pipe Association of Australia – PIPA – recognised the need to provide guidance to define the parameters that characterise PE100 HSCR grades. As an interim measure, POP016 guideline was developed in partnership with the plastic pipe industry. It sets out the performance requirements that will be used to define PE100 HSCR material during this interim period. PE100 HSCR compounds must comply with both AS/NZS 4131 and the requirements listed in POP016. Compounds meeting all these requirements will be identified in POP004 as PE100 HSCR.